aux2mondes is an internet audio work consisting of women's commentaries that are non-narratively linked in order to create a story based upon the user's interest and intuition. 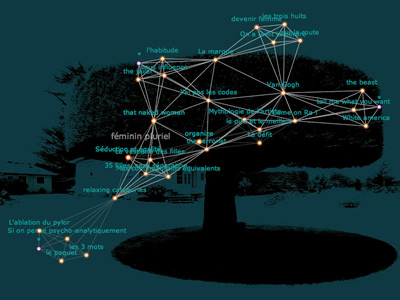 The project aux2mondes concerns representation but before all "human linkage". Interviews and soundscape are linked with keywords and the interface traces their progress. This approach--like sound itself--resists the voyeurism inherent in representation and returns the user to her or his own self-interest. To interact with the graph you can just click on a node which then repositions itself in the center. 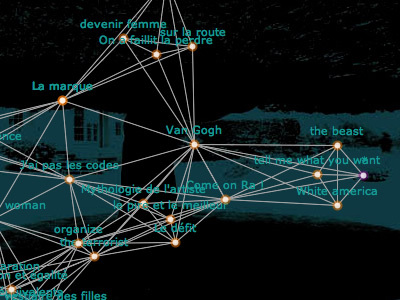 Click once more on that node to listen to the interviews and soundscape.